The excitement was palpable at last night's opening of the world premiere of A Comedical Tragedy for Mister Punch. I brought the whole family and the teens and adults all loved it! This show is phenomenal kick off to The House Theatre's 15th season. 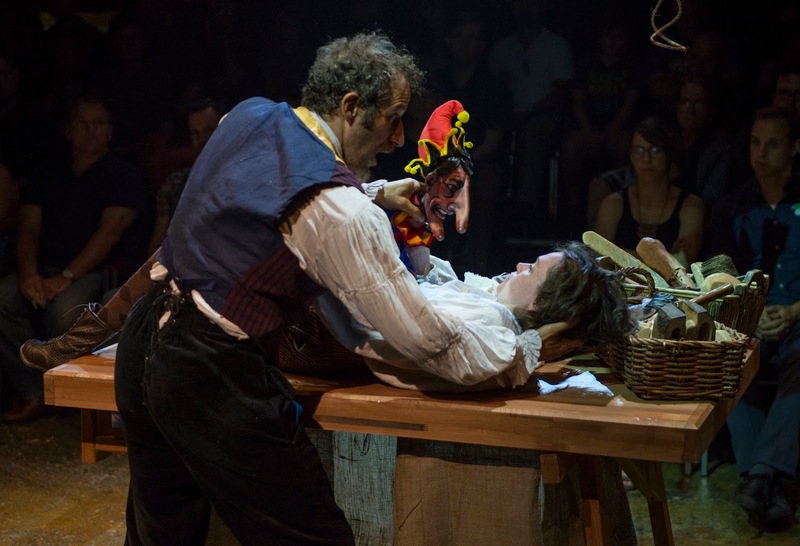 We highly recommend A Comedical Tragedy for Mister Punch. It's not only wildly and wonderfully entertaining, but a compelling commentary on the value of street art and in fact, art's place in society. 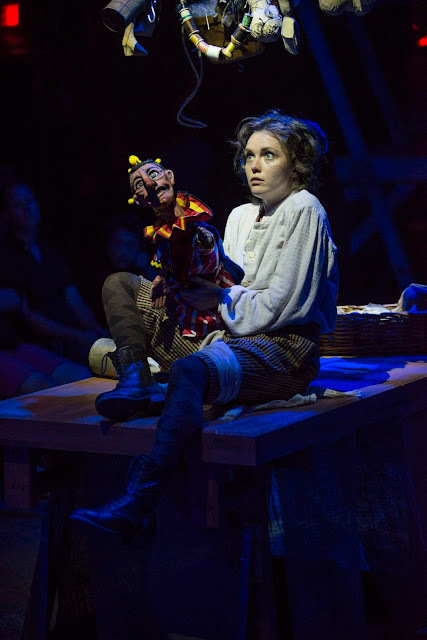 We love the character of Charlotte (Sarah Cartwright), the young orphan, and we're thrilled she's a bright and scrappy girl, when there's still such a lack of great role models who are young girls in major roles. 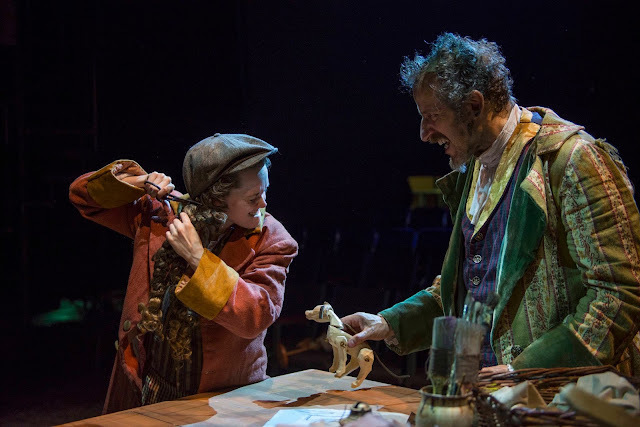 Adrian Danzig is also brilliant as the gruff loner puppeteer, Pietro. Don't miss THIS!! ... and that's how it's done. 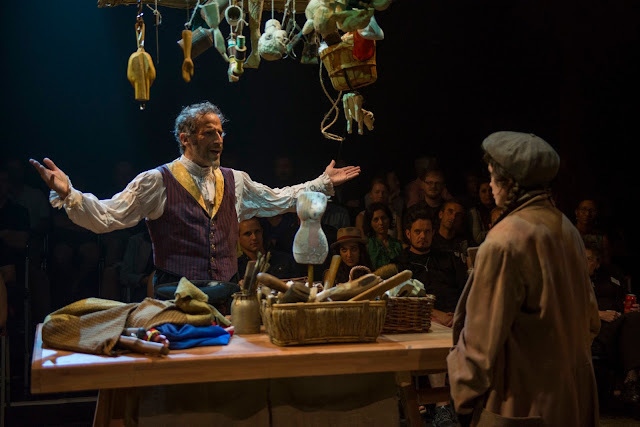 House Theatre has long been one of our top favorites on the Chicago scene, and they consistently bring stellar story telling to the table in creative ways. 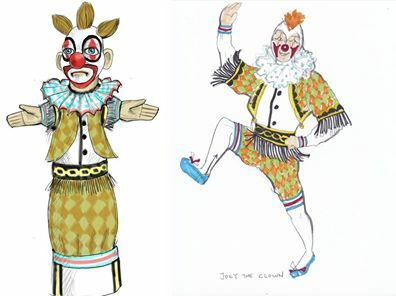 We're completely enamored with this script and the clever staging that brings the iconic Punch and Judy puppets to life as human sized players. 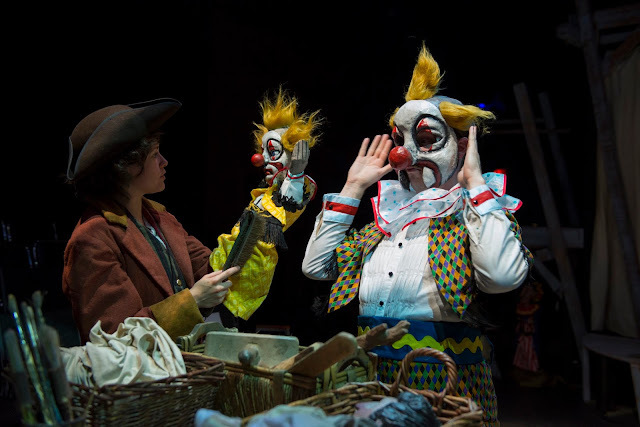 This production at once explores the cathartic violence that characterizes the infamous Punch and Judy genre and shatters it, with a young girl who's ready to move the narrative beyond the wife beating, baby killing, bad boy schtick. Highly recommended! Come one, come all. Come small, come tall. ‘Tis time, dear Punch. The House Theatre's attention to detail is stunning, from their programs, which are always works of art in themselves, to the set design and props. We adore the collectable postcards that turn into 3 different finger puppets. 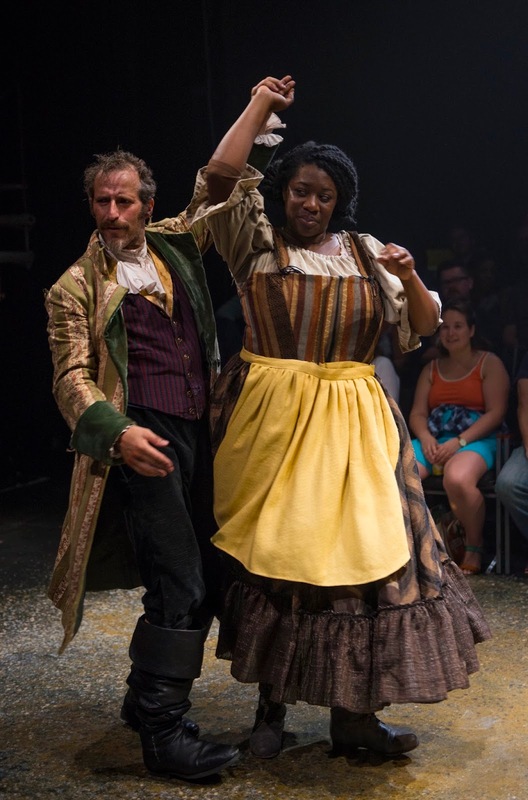 The House even thoughtfully provided baskets of scissors and tape so the audience could assemble theirs on the spot! Do note, this is not a children's show. Everyone has different levels of comfort with violence, so younger children could enjoy this production with parental guidance, but the storyline is truly aimed at teens and adults. 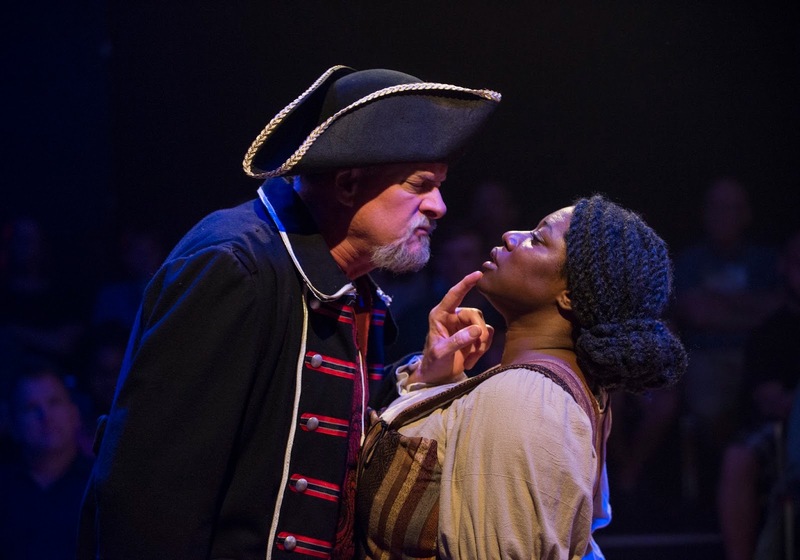 Dangerously dark and decidedly violent, this production is best enjoyed by adults and teens. Read the Parents' Guide for content warnings. Whenever The House Theatre announces a new show or a favorite remount I get all excited like a little kid at Christmas. Their season opener is no exception. They had me at the title. 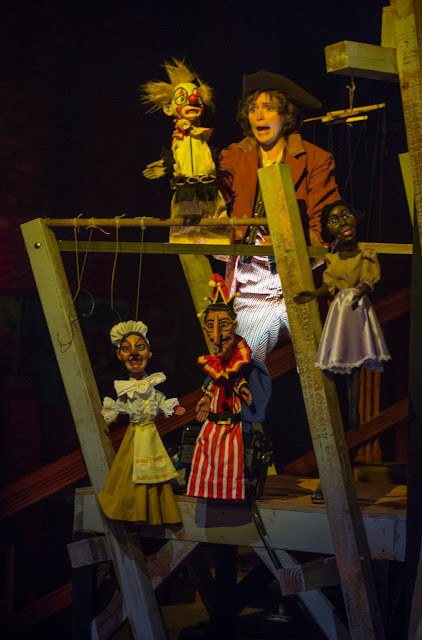 I mean really, The House Theatre prowess AND puppetry are two of our favorite things. And, extra bonus, Adrian Danzig, Chicago dad and one of our favorites for physical comedy, stars as Pietro the puppet master in this world premiere. 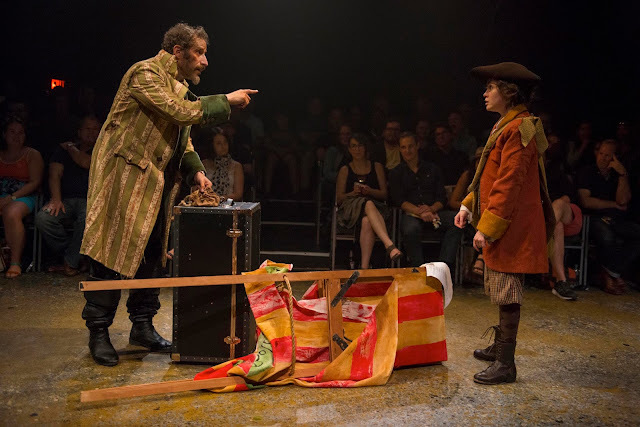 We've known him since his son was in preschool with my 13 year old daughter and we've adored his work in 500 Clown, Go Dog Go with Chicago Children's Theatre, and so much more. 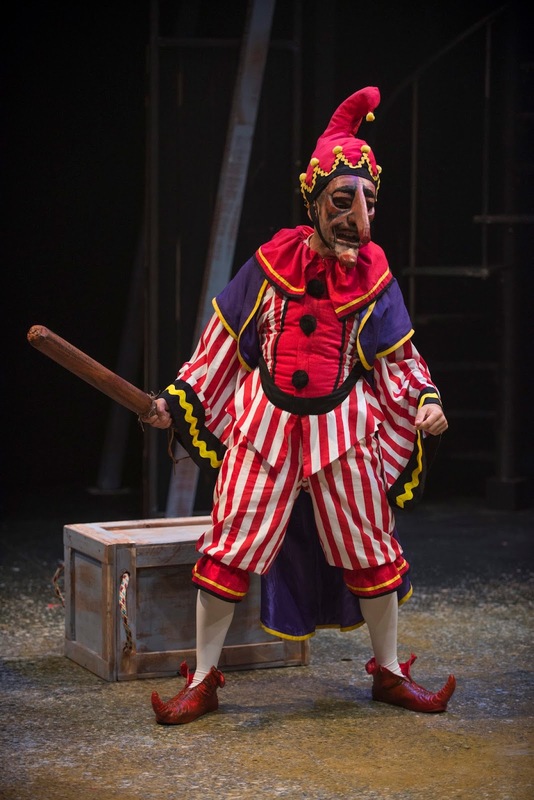 The House Theatre of Chicago is proud to announce its 2016 – 2017 season opening production, the world premiere of Kara Davidson’s A Comedical Tragedy for Mister Punch. Influenced by the long history of puppets, Punch and Judy, and directed by Shade Murray, the production runs September 2 – October 23 at the Chopin Theatre’s Upstairs Theater, 1543 W. Division St.
GROUPS: Save up to 30%! Start here! Regular run tickets range from $30-35. $15 same-day tickets for students and industry professionals are available for all dates, seats permitting. 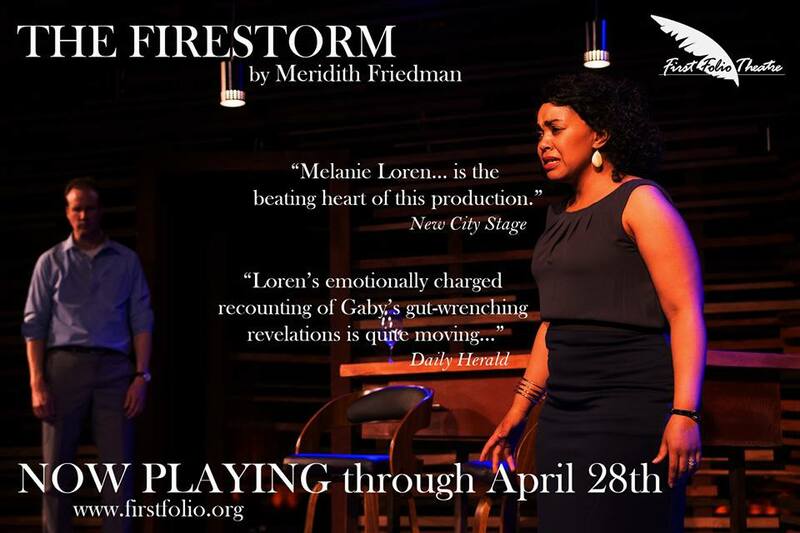 For more information and to purchase tickets, please visit www.thehousetheatre.com or call 773.769.3832. 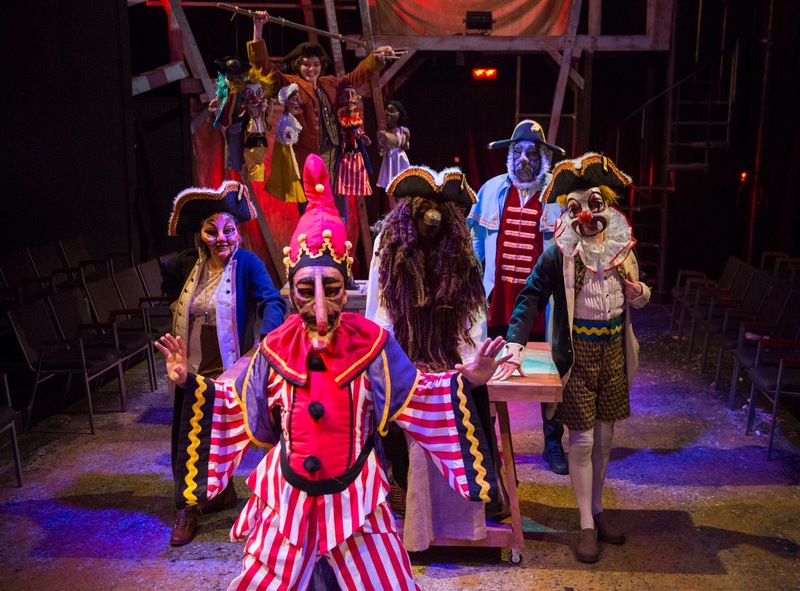 Davidson’s A Comedical Tragedy for Mister Punch takes audiences back to the arrival of the Punch and Judy show in 18th-century England, before it became a popular seaside and country fair entertainment staple. The production features puppet creations from Jesse Mooney-Bullock, designer of the puppets for The House’s The Hammer Trinity. Today, many Punch and Judy shows are censored, removing Punch's cruel and murderous nature, opting for themes that are more palatable for youthful ears. But Mister Punch can't escape his peppered past. Why do we cheer for this scoundrel? How does Mister Punch, a character who has been depicted as a merciless hero-villain for over two hundred years, get away with abuse and murder? 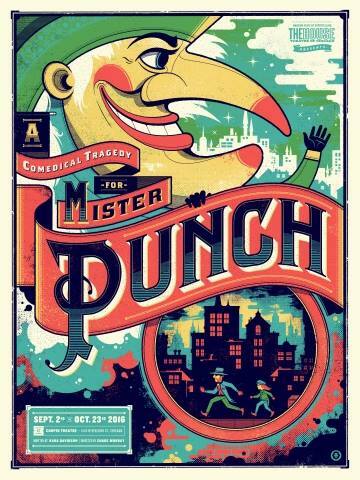 Perhaps something meaningful lies underneath Mister Punch's colorful yet ruthless exterior. Pietro instructs Charlotte to keep an eye out for the Officer during the show. Charlotte, a young orphan, has made a life for herself thieving on the streets of London. 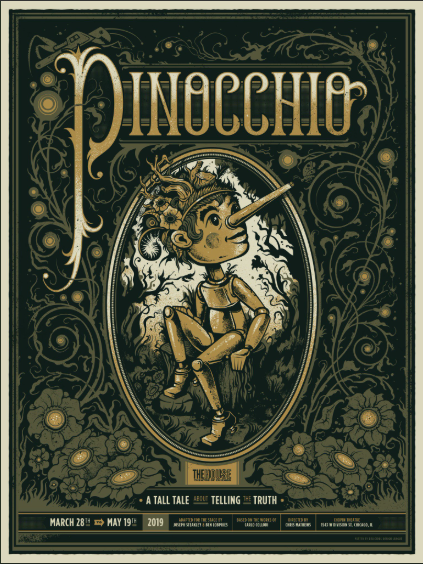 She wiggles her way into employment for an eccentric Italian puppeteer, Pietro, collecting coins from his crowds and watching out for the law. They quickly become an efficient pair under Pietro's gruff and focused attention. As their partnership flourishes, so does Charlotte’s vivid imagination. Soon, the violent Punch and Judy puppets jump to life as she conjures up her own spins on the classic tales. But Pietro may not want his protégé pulling the strings. Our "merry little play" reveals the dark underbelly of 18th century London as Charlotte’s reality blurs with the frantic world of Punch and Judy. Filled with live actors, hand puppets, shadow puppetry, and marionettes, the story uncovers the dangers lurking in an unjust world. The Magic Parlour is one of our top favorites of all times, and nothing short of astonishing. Dennis Watkins is out of the dunk tank and into the parlour! 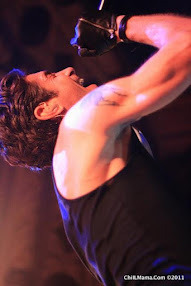 Death and Harry Houdini (with its nerve wracking water torture chamber trick) has finished another acclaimed run, but you can still catch the star, prolific prestidigitator, Dennis Watkins, in his snazzy solo show at the iconic Palmer House Hilton in downtown Chicago. 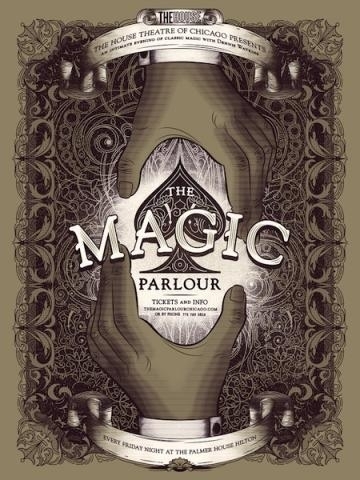 I caught The Magic Parlour back when the show was playing in the shabby chic basement of the Chopin Theatre. Several years back they moved to fancier digs, and this intimate show has grown in popularity. We took the whole family last year and even the jaded teens adored it. Dennis is the real deal, and a joy to see in action. Prepare to be mystified. Oh SO highly recommended. ChiIL Mama's Chi, IL Picks List. Performances begin again September 2 with more performances this year than ever before! RUN TIME: The show runs about 75 minutes. An intimate evening of classic magic with Houdini himself, in the historic Palmer House Hilton Hotel. Award-winning, third-generation magician Dennis Watkins delivers an evening of sophisticated tom-foolery in one of the Windy City's most unique entertainment experiences. Dennis Watkins. Experience the premier magic show in Chicago, featuring mystifying feats of prestidigitation, sleight of hand, mentalism, and more. The Magic Parlour is replete with mind-blowing magic and mind reading in an intimate suite at the historic Palmer House Hilton Hotel. Guests convene at Potter's on the lobby level and will be escorted to the private performance venue. The House is Chicago's premier home for intimate, original works of epic story and stagecraft. Founded and led by Artistic Director Nathan Allen and driven by an interdisciplinary ensemble of Chicago’s next generation of great storytellers, The House aims to become a laboratory and platform for the evolution of the American theatre as an inclusive and popular art form. first recipient of Broadway in Chicago’s Emerging Theater Award in 2007, and was awarded a 2014 National Theatre Company Grant by the American Theatre Wing, founder of the Tony Awards. Now in its 14th year of original work, The House continues its mission to unite Chicago in the spirit of Community through amazing feats of Storytelling.